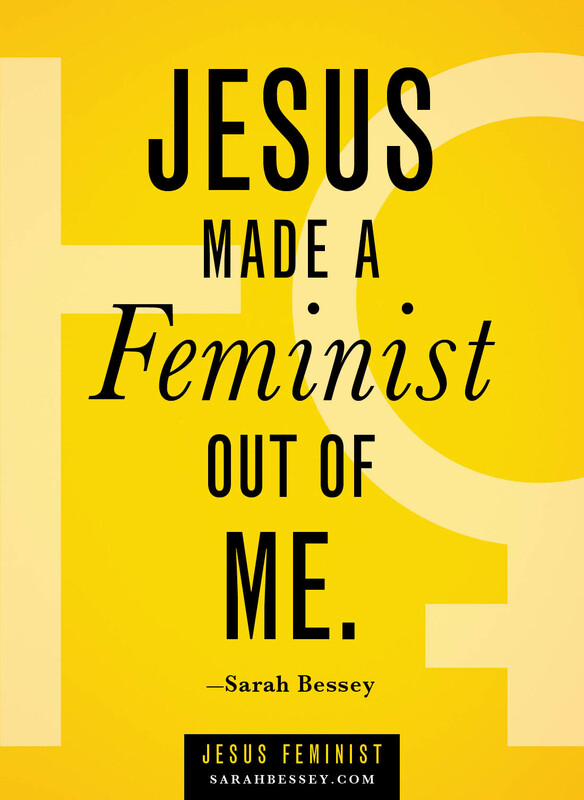 In the first chapter of her book Jesus Feminist, Sarah Bessey declares, "Jesus made a feminist out of me." Later she defines Jesus feminist for anyone left perplexed by the term: "I call myself a Jesus feminist because to me, the qualifier meant I am a feminist precisely because of my life-long commitment to Jesus and his Way." I am not a Jesus feminist, but I want to be. I am a Christian and I am a feminist, but I am not a Jesus feminist, at least not according to this definition. I am not a feminist because I am a Christian. In fact, I've spent the past decade declaring that I am a feminist despite the fact that I am a Christian, or vice versa. I've spent the past decade wrestling like Jacob with the angel trying to reconcile these two belief systems that are at the center of almost all that I do. But I am tired of the battle. And this battle is a silly one. We weren't too precious for words, dainty like fine china. We received no free pass or delicate worries about our ability to understand or contribute or work. Women were not too sweet or weak for the conviction of the Holy Spirit, or too manipulative and prone to jealousy, insecurity, and deception to push back the kingdom of darkness. Jesus did not patronize, and he did not condescend. Bessey, a Canadian, didn't grow up with many of the ideas about gender roles that prevail in America, especially in the Southeast where I live. She didn't face these issues until later in her Christian life. Ironically, even though I'm a Southern girl I didn't grow up with gender stereotypes either. My parents always taught me I could be whatever I wanted to be. Period. But I'll never forget the day when, excited by a sermon I'd just heard, I remarked that the preacher got me so interested in the Bible that it made me want to go to Bible college and be a preacher one day myself. I was quickly corrected by a well-meaning elder: "Now, you know women can't be preachers." Disillusion and disappointment have marked much of my church life due to attitudes regarding gender, race, sexuality, class and more. I've even gone through periods where I've stopped going to church altogether. But as Bessey writes, quoting Sara Miles, "You can't be a Christian by yourself." So as I continue to re-read Jesus Feminist I will continue to deal with my doubts, my questions, and my hurts. I will continue to, as Bessey suggests, lean into the pain, trusting that there is a balm in Gilead. If you are reading Jesus Feminist along with me, please leave your thoughts on chapters 1-3 in the comments section. I will check this book out. Sounds interesting.